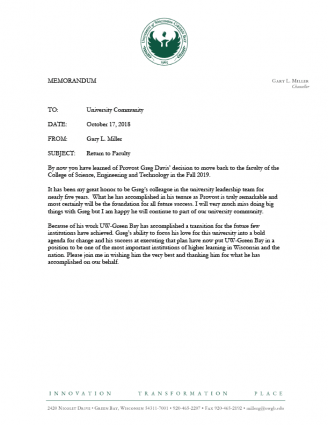 Today, UW-Green Bay Provost Greg Davis issued a memo to the University community announcing that he is returning to teaching beginning in Fall 2019. 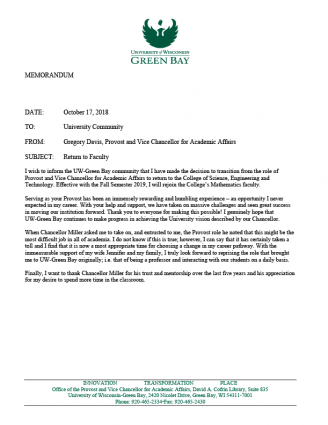 Within a half-hour, the UW-Green Bay Office of the Chancellor emailed a response expressing Chancellor Miller’s honor and gratitude to Davis for his service and leadership. See both memos below.